To avoid confusion when researching your genealogy, you may want to use a commonly accepted numbering system to keep everyone straight. One well-known numbering system is called ahnentafel, which means ancestor (ahnen) and table (tafel) in German. You may also hear the ahnentafel system referred to as the Sosa-Stradonitz system of numbering because it was first used by a Spanish genealogist named Jerome de Sosa in 1676 and was popularized in 1896 by Stephan Kekule von Stradonitz. Of course, y isn’t really a number — it’s a letter. In this mathematical (that is, algebraic) example, y represents a unique number for that particular person. Continue this pattern through the line of ancestors. The mathematical relationship works the same way going forward through the generations — a child’s number is one-half the father’s number and one-half (minus any remainder) the mother’s number. John Duff Sanders, b. 10 Mar 1914 in Benjamin, Knox Co., TX; d. 15 Mar 1996 in Seymour, Baylor Co., TX; ma. 24 Dec 1939 in Sherman, Grayson Co., TX. John Sanders, b. 19 Oct 1872 in Cotton Plant, Tippah Co., MS; d. 2 Mar 1962 in Morton, Cochran Co., TX; ma. 28 Sep 1902 in Boxelder, Red River Co., TX. Nannie Elizabeth Clifton, b. 1 Apr 1878 in Okolona, MS; d. 27 Apr 1936 in Morton, Cochran Co., TX. Harris Sanders, b. 27 Mar 1824 in Montgomery Co., NC; d. 21 Feb 1917 in Tippah Co., MS; ma. 26 June 1853. Emeline Crump, b. 20 Oct 1836; d. 21 Feb 1920 in Tippah Co., MS.
William Clifton, b. 5 Mar 1845 in SC; d. 9 Feb 1923 in Boxelder, Red River Co., TX; ma. 5 Nov 1872 in Birmingham, AL. Martha Jane Looney, b. 8 Mar 1844; d. Boxelder, Red River Co., TX. John Duff Sanders is number one because he’s the base individual for the ahnentafel. 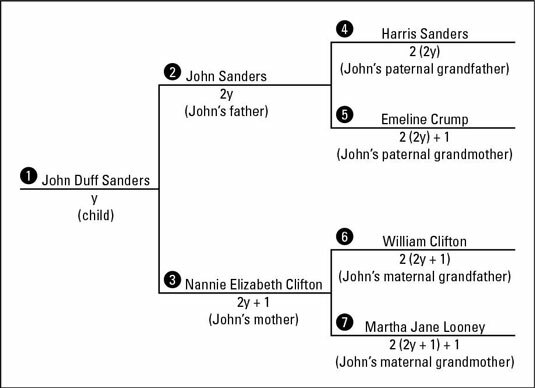 His father (John Sanders) is number two (because 2 x 1 = 2), and his mother (Nannie Elizabeth Clifton) is number three [(2 x 1) + 1 = 3]. His father’s father (Harris Sanders) is four (2 x 2 = 4), and his father’s mother (Emeline Crump) is five [(2 x 2) + 1 = 5]. John Sanders’s number (2) is one-half his father’s number (4 / 2 = 2), or one-half minus any remainder of his mother’s number (5 / 2 = 2.5; 2.5 minus remainder of .5 = 2) — well, you get the idea. As you can imagine, after a while, you begin to tire from all these calculations — especially if you do them for ten or more generations of people. So, if your genealogy software supports ahnentafel reports, you should run one — saving you a lot of time and trouble.